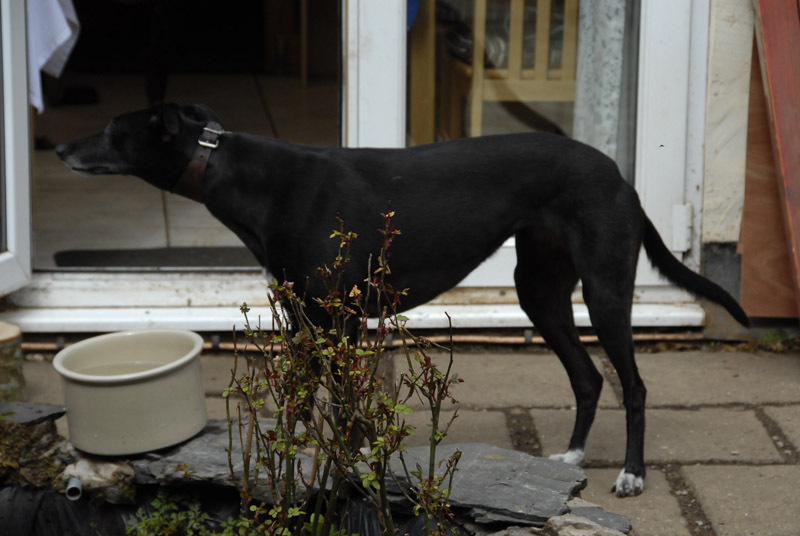 Koo is a lovely black ex-racing greyhound who has been living in a home for 2 years. Sadly her owner had to go abroad to look after family and is unable to take Koo with her. Koo is 5 years old, spayed, walks nicely on the lead, is fine with children and other breeds of dogs. It was a lovely day today so we took some photos of Coco, as she is now called, in the garden. This afternoon Coco went off to her new home where she will be living with Billy. They were very much attracted to each other when they first met so we hope they both have a long and happy life together. We heard today that Coco is settling in nicely. Her pad with the corn has improved a little, but still hurts her on occasions. The duct tape comes in handy and her new owner wraps it up with a foamy corn cushion! At one time Coco and Billy were both going the pub with the same toe on the same paw wrapped in duct tape! Coco's owners noticed last week while they were away she seemed really happy. The place they were staying had a garden she could run around in, since coming home and having no grass, the pavements seem to be causing pain while on her walks because of the corn. They have tried wrapping it with duct tape, which worked and the corn did come out. She was then pain free for about 3 weeks until it came back, and she started not wanting to get off her bed to go for walks. Since her owners saw her so happy in a large garden they worry that she does not have the best quality of life with them at the moment, so contacted us for advice. Having now got the details of the greyhound vet who specialises in corns, and who did a study on them, I passed the details onto Coco's owner and suggested she ring him with a view to him removing the corn. We received an email today thanking us for our Christmas card and letting us know that Billy and Coco are okay. Coco is doing well. The greyhound vet we recommended to look at the corn removed it. It took her a while to recover because he 'digs deeper' than most vets, so rarely does the corn return. Her owner said the surgery really seemed to upset her. She was limping for a long time afterwards, but now her owners say she is like a different dog, the pain must have been really severe.